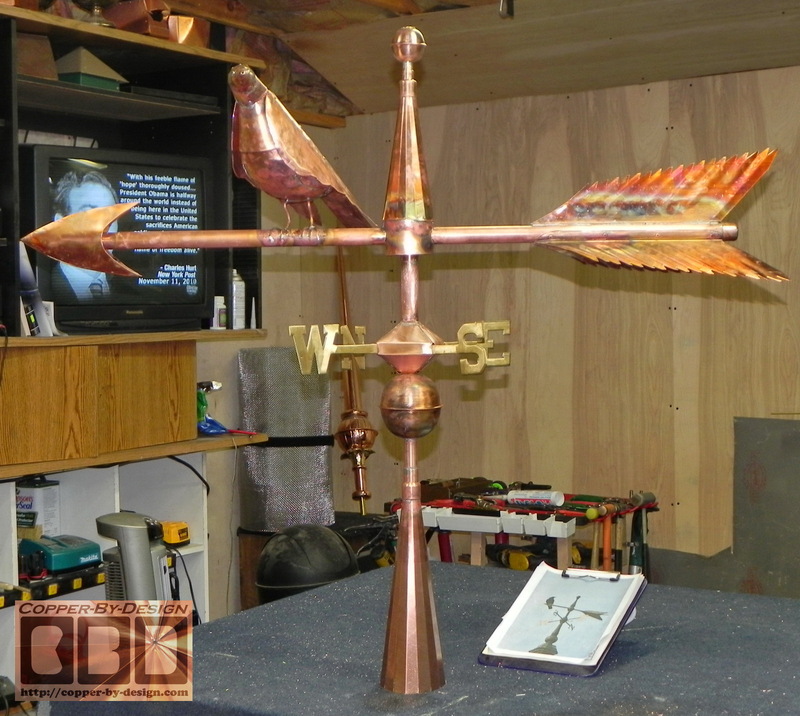 CBD rarely makes weathervanes because the the high cost for this sort of time consuming custom work, compared to mas-produced weathervanes. Our main focus if building the roof peak cap with a finial/weathervane support built in. I had asked to make this custom classic 3 tail feather arrow shaped weathervane with a life size 3D crow figure perched on the shaft for a client in Chautauqua, New York. I used a thick 32oz copper for this project. 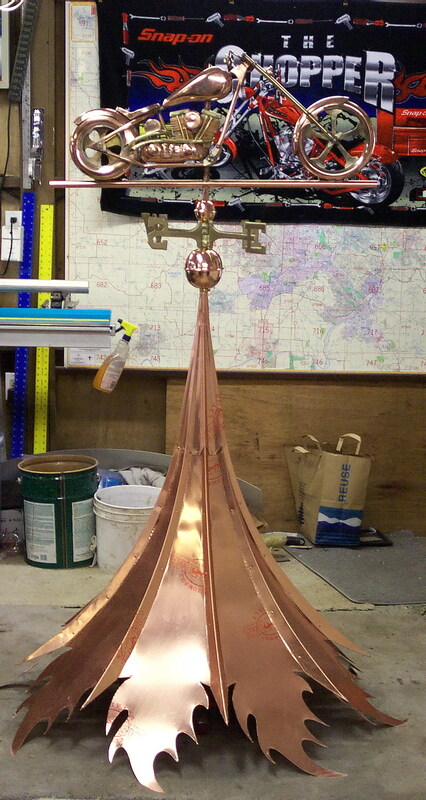 It is supported by this 44" wide turret roof cap we also made with 20oz copper. 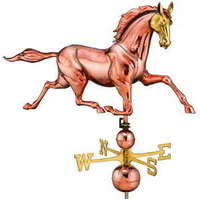 Any custom weathervane is going to run you 4 to 5 times more than the cost of a generic weathervane, and is probably not going to look as refined as most any mas-produced weathervanes, but one advantage is I make them sturdier. Do we have to buy these from you along with a roof cap order? 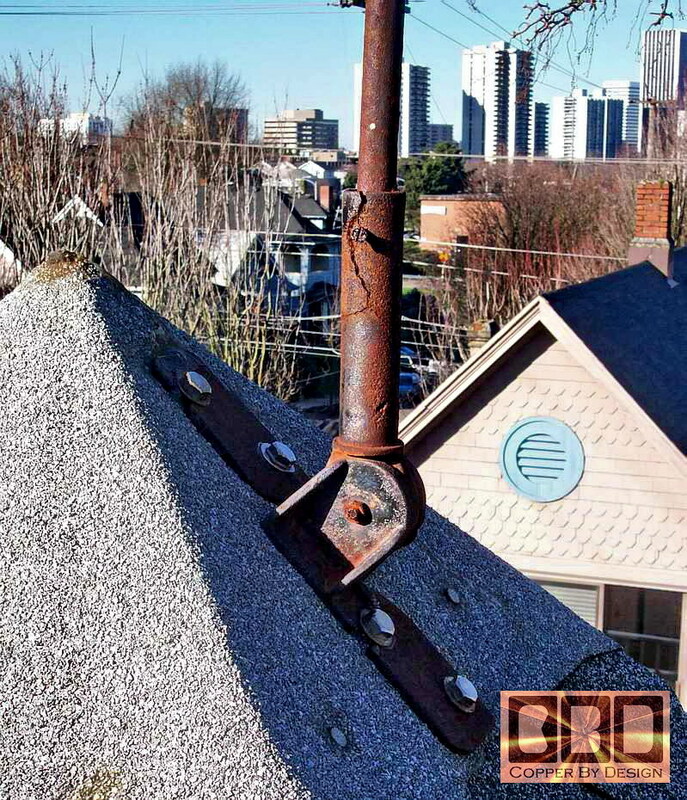 No, you are not required to get your weathervane through CBD with a roof cap order, but you will not find a sturdy long lasting roof mount elsewhere, which is our specialty. A lot of wind torsion can be subjected to the side of these weathervanes and a simple hole drilled into your roof would be a rather soft mount, which will not last. It would be prone to leak, hard to make sure it is perfectly level, and not remain lever, which will impede the rotation of the weathervane. Any sideways angle will not permit the weathervane to rotate properly, which will cause you a good deal of grief down the road. Good Directions does sell a sturdy steel roof mount, but again very tricky to level just right and also prone to cause leaks over time due to the lag screws working loose. But the worst issue is how these mounts will cause unsightly rust streaks down the roofing long before they fail all together. I would customize these weathervanes to make sure they will fit best with our custom copper roof caps, so they will go together without any hang-ups, and make sure the solid 3/4" mast rod is the right length and all hardware is rust proof. There are dozens of web sites and garden shops selling these same products. Although, we do offer a 15% discount when purchased with our custom roof cap orders, and of course we cannot assure you that they will go together without a problem if you get them through another source. If you do find another source, you could have it shipped over to us, in order to customize it and make sure they will join together just right. We have pretty much had to make some modifications on each one we have dealt with. If the weathervane you already have uses a steel mast; a solid brass rod can be purchased through us to replace your steel shaft. A simple magnet test can be done to see if it is just plain steel that will rust. Only steel will attract a magnet. Another indication is paint over the shaft. There would be no need to paint stainless steel, copper, or brass. Unlike most all the other web sites selling these products, we prefer not to play that price game with our clients to make them think we are less expensive than it really will cost. 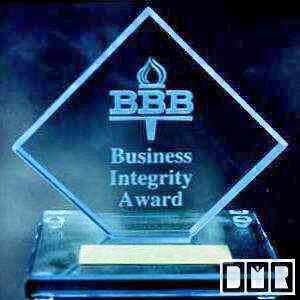 There are no hidden charges including shipping within the continental USA. We list several of our competitors on our Site Map web page that you find a link to at the bottom of each of our web pages to compare prices. Even without the 15% discount our prices should be less. How much do these cheaper ones cost? They range from $180 to $850. 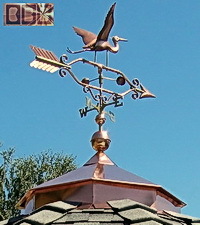 We have a selection of over 100 different weathervane and ornate finials shown in our photo pages with the price listed including shipping within the continental USA and any modification needed for use in our roof caps. A detail you are not likely to find else where. What about custom weathervanes that are stronger? 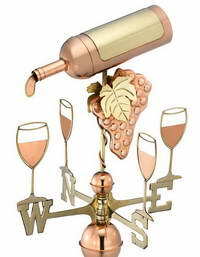 It is true that these weathervanes shown below are not made by us at Copper-By-Design. 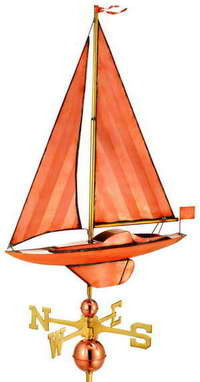 They are made with a thinner copper with some cast brass and stainless steel parts. They are less expensive and easier to form with mass production press equipment. It is true they could dent fairly easily, but being up high on a roof they are not too likely to suffer impacts. They are soldered together with minimal overlapped seams. 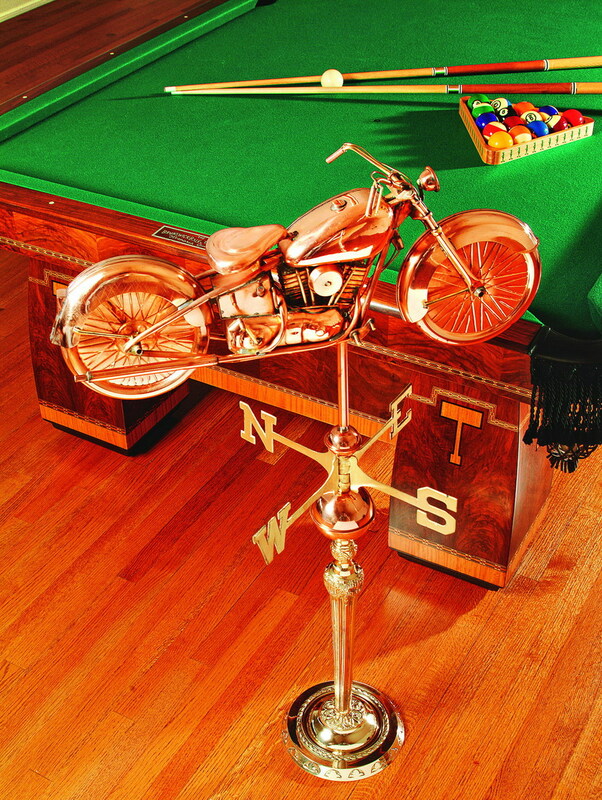 A stronger custom USA made weathervane would range in cost from $1,500 to $3,500, depending on how large and ornate they are. The wait time would be also be a lot longer as well. There are a couple shop in the US who specialize in this sort of artistic work. 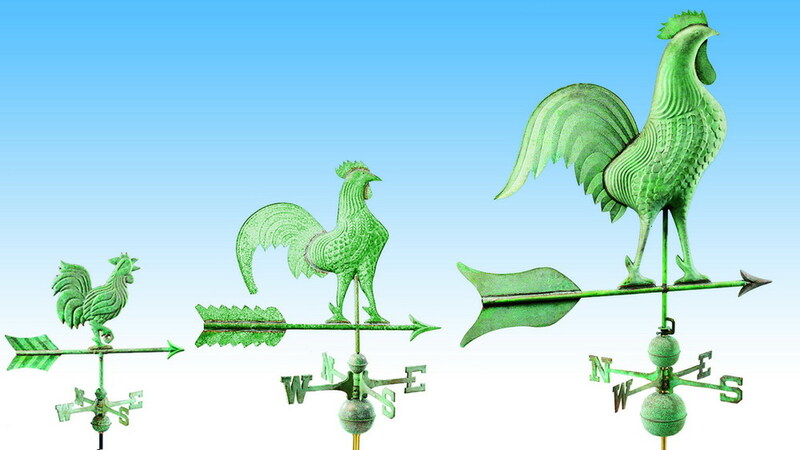 We list one on our Site Map page: Westcoast Weathervanes. 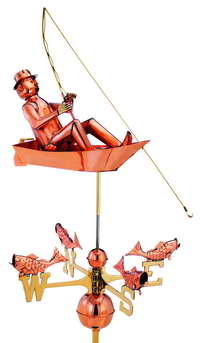 We could make stronger custom weathervane like we do for the roof caps, but we would have to charge about 4 times as much, just like any other custom shop. 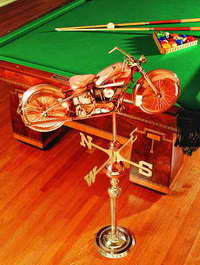 With these inexpensive alternatives, we have yet to find many clients willing to pay over $2k for a custom weathervane. 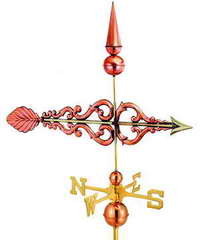 We are a retailer for Good Directions, who is a wholesaler of lots of inexpensive weathervanes and other copper decorations made in foreign lands by slave labor. Do we need a stronger custom made weathervane? 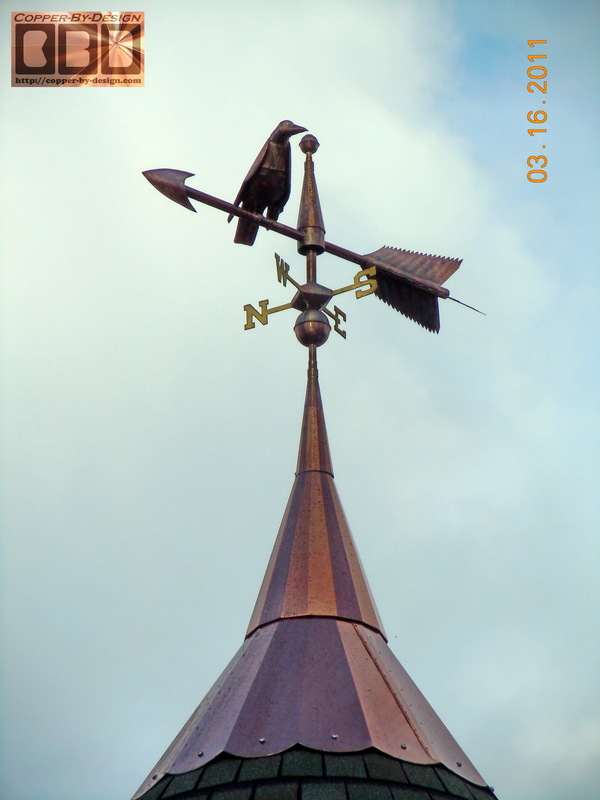 A stronger custom finial or weathervane can still get damaged in a storm. If later on one of these were to get damaged, they would not be as much a loss as a custom made unit. 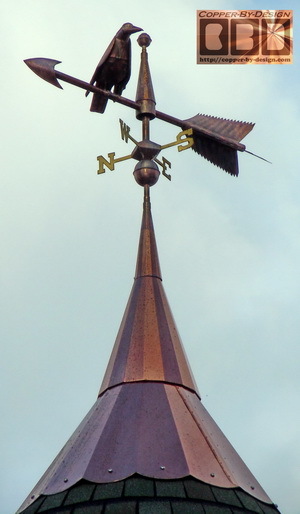 Another consideration is if you find a different finial or weathervane that you like better, you can decide to change it out for this first one. 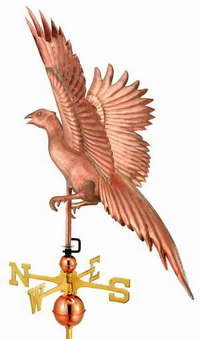 We feel that about the only reason to pay so much $ for a custom finial or weathervane is if there is a very specific design you want not already made in such quantity. 15% discount w/custom CBD roof cap order. Please note that some of these may be out of stock or have been discontinued without notice. We do not stock any of them, so I am subject to what ever Good Directions has in stock. Click photo for a better look at each weathervane. Click here to go back to the Custom Copper Roof Cap main page to see more of the different caps we have created over the years.